I’m not going to talk about how having this simple procedure detects cancer early and, literally, saves lives – that’s old news. And I’m not going to try to persuade you to have one by telling you how one no longer has to drink gallons and gallons of nasty-tasting stuff like they used to the night before – you’ve probably heard that 100 times. 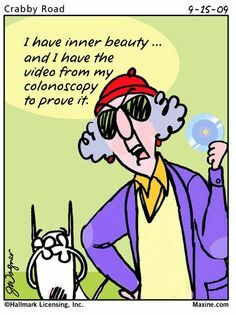 What I DO want to talk about is the benefits of having a colonoscopy that nobody else is talking about – the ones that will make you smile. 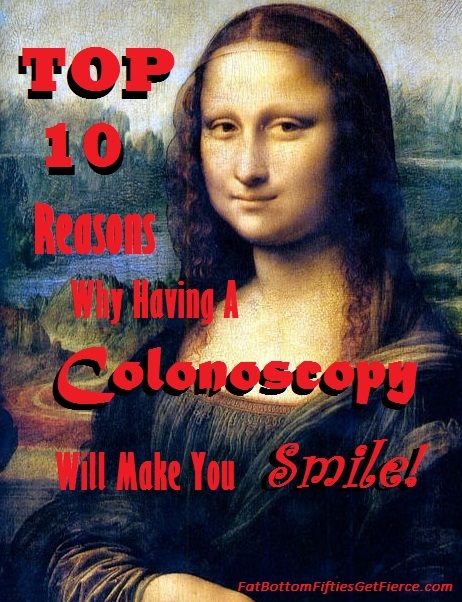 There wasn’t room to list them all, so I have selected the Top 10 Reasons Why Having a Colonoscopy Makes You Smile. 9. You get the day off work. 8. Just when you think age has caused you to slow down, the time it takes you to get to the bathroom from the living room will prove you wrong. 7. Free fuzzy socks with non-slip grippers. 6. The warm blanket – mmmmmmmmm. You’ll be so busy wondering where you can buy a blanket warmer, you’ll forget why you’re there. 5. It will be the one time in your whole life when you will be encouraged to pass gas while others are present. 4. You’re sure to lose a pound or so in the process – without exercise! 3. You will finally get some of that sleep you’ve been needing. And the number one reason why having a colonoscopy makes you smile?? * We are both qualified to tell you that!